West Ham’s goalscorer thinks Manchester City are favourites for the Premier League title after his team took points off us last night. Michail Antonio finished nicely in the first-half after running past our defence, which was caught out by a clever free-kick routine. “It’s a good question, all three teams are coming into form and doing well,” Antonio told Sky Sports. “Liverpool are starting to drop some key points lately. So, I’m going to have to say Manchester City. 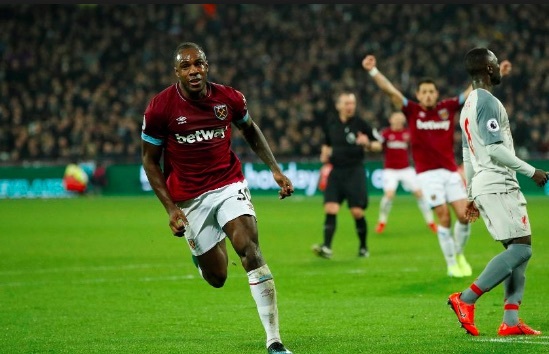 We did look bad when West Ham had set-pieces to be fair, but on more than one occasion a flag should have been put up by the linesman – although he also made a mistake by not giving James Milner offside for our goal. Our backline has looked sloppy in recent weeks, but the reasons why are obvious. Virgil van Dijk has been suffering from illness and according to Jurgen Klopp, has lost three or four kilos this month. We’ve not had a real right-back play at right-back, and Andy Robertson’s insane form has dropped off. On top of that, Alisson could have performed better. We really hope we secure a clean-sheet on Saturday an get back to winning ways!